Home › News › To Infinity and Beyond! Making a £10 Correx SpacePod. 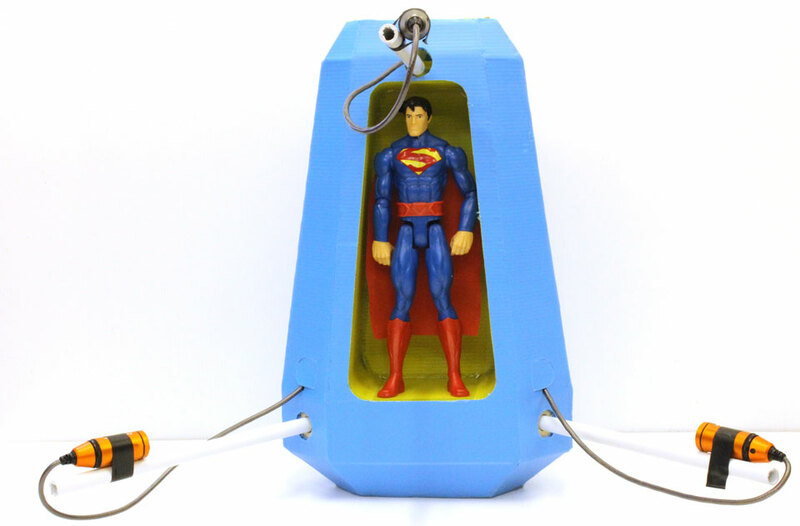 This is a picture of a Superman Figurine being ejected from a SpacePod in Space! 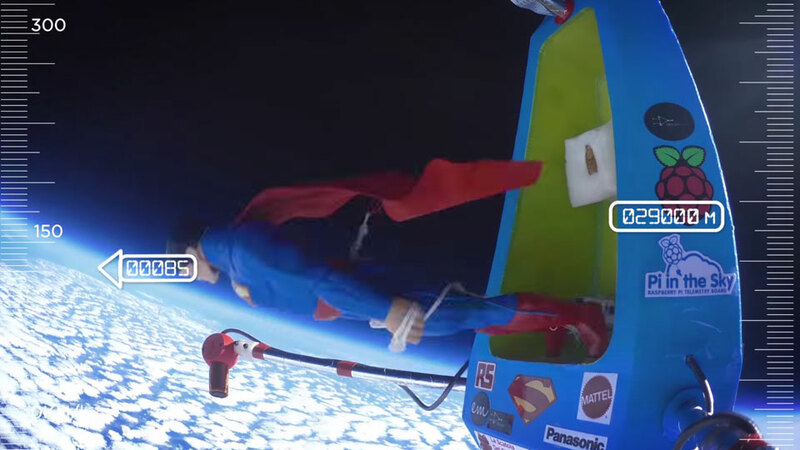 The project was for Mattel Toys to put Superman up to the edge of space, similar to that done by Felix Baumgartner in the Red Bull capsule. Copy-cat, possibly, but when you consider this build was done in the Reading Hackspace for under £500, (with the capsule itself costing around £10) it’s certainly taking things to a different level. Naturally, as geeky-types, we set about defining the parameters of the project, from spacial constrains, masses, electromagnetic considerations of the wiring, etc. to ensure that we could design for all the components we had. Indeed, for more info on the electronics, I’m not the person to ask – for that check out DesignSpark. What I did bring to the team was the rapid-prototyping – and by this I mean a fast way to get our ideas off the white-board and into something we can evaluate. As you can see from these models, it’s far from fancy, but it allowed us to check the video angles of the three 4K Cameras, and so ensure that when our superhero ‘jumped’ out of the capsule, he would be filmed just right. We quickly established the minimum constraints of the build, and also made a base, which we check filleted all the electronics (batteries, GPS systems, etc.) Given that this took around 2 hours from start to finish, I think this speaks for itself. Now that we had the essentials, we could move to CAD, confident that our dimensions were pretty much spot-on. The beauty of CAD being that we can work on it iteratively over long distance from the comfort of our homes. One of the interesting developments in this project was the realisation that although I had been working for some time with Cardboard – and indeed, had even created a specialist tool (The Card Rabbet Tool), I now realised that this Tool was great work working with Correx, which is essentially Corrugated Plastic. However, where as with Card this Tool is optional, with Correx, this Tool is essential – so it now opens up a wider range of applications for this material. You can read more on this Tool here, and [free] download and 3D Print it for yourself. The fact that Correx is waterproof was not lost on us – and we realised that this material would keep the electronics safe from rain; provide some insulation; absorb the shock of impact; allow wires to be threaded along the ‘fluting’; allowed PCBs to be Velcroed to it; quickly assembled with Glue-Gun – all the while only weighing in at 500g when made and costing very little. After my first weekend, I was able to return to the team with a substantial model which we could trick-out with our high-tech electronics gear. This is the final SpacePod, you can see more on how it was made on my Instructable guide. Over the course of a caffeine and pizza-fueled weekend, everything came together – we had all our sponsorship logos in place and we were ready to launch! The whole mission was filmed successfully, and ended up on Italian TV! In fact one issue was the images looked ‘fake’ as they were so sharp and the angle was well-stabalised, but this is really due to the quality of the 4K Cameras! …Safe to say, we found the Space Pod near one tree and Superman atop another. After some 4 hours, we eventually our GPS-tracked SpacePod and Superman back – though funnily enough, all the tree-climbing and faff never did make the video edit. We had a great time…And if you’re watching NASA – feel free to get in touch.